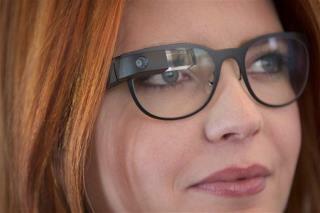 (Newser) – The Verge sums it up thusly: "Google Glass just got a lot less geeky." That's due to today's announcement of the Titanium Collection for Google Glass, a fashion-forward collection of four extra-light titanium frames that will offer an option to those with bad vision—or those who don't want to use the standard headband Glass ships with. Mashable reports that the new frame styles (named Split, Thin, Bold, and Curve) are available to those in the Google Glass beta program for $225 (on top of the $1,499 they paid for Glass, of course). It seems like there ought to be all kinds of amazing apps that automatically translate every sign and menu for you when you are in a foreign country, give you walking or driving directions, show the name of each person you pass on the street by matching them to facebook photos, convert voice to text for the deaf, etc. But... at the moment it seems too easy to get arrested for wearing them. I can't believe how accident prone all the responders are here. I have worn glasses for 40 years and broke only one pair (playing basketball in junior high school). That doesn't mean I could afford the price. The only chance of success is if they really aren't just a novelty product. All my computer geek friends still think the pads are useless novelties.